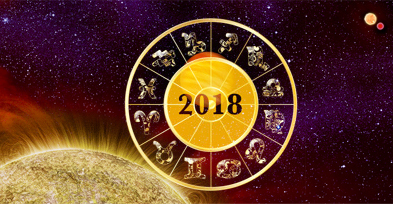 The Gemini 2018 Horoscope denotes a year that is full of ideas. The year though may overall yield average results. Your mind would be full of creative ideas that should see you becoming part of mega projects at work. However you may face some opposition when it comes to implementing those ideas. This could be one of the reasons your ideas may not be as productive as expected. Mind would seem to be wandering and hence concentrating on a particular task at times may seem difficult for you. You could find yourself engrossed in different ideas and projects, so it is advised that you take up one important issue at a time and then move ahead at a steady pace. Follow this and you should see yourself going smoothly at both personal and professional life. An increased level of creativity & mental capability promises a rewarding career for Gemini in 2018. Handling teams and large projects would not be any problem for you thanks to your multi-tasking ability and innovative thinking. You are likely to experience an increased efficiency at work too. However this doesn�t mean that you have to get involved into everything and anything. Prioritizing work holds the key for success in 2018. Your ideas and vision should take you to new heights after 12th October 2018. This trend is likely to continue till the end of the year. Your leadership qualities also appear to be heading in the right direction. You should find yourself at the helm of a very supportive and cooperative working environment. It is better to avoid any tie-ups or partnerships especially if they involve a foreign party as these are unlikely to bear fruitful results. Your ideas may experience slight rejection in the initial period of the year, particularly between April & August 2018. Try to make clear plans before investing your money in any business. A thorough study and careful planning should be done to succeed in investments. Gemini Horoscope 2018 indicates some new sources of livelihood giving an overall increase to your financial well being. Avoid taking financial tips from people who don�t hold much expertise as these could result in losses. Careful spending and managing your assets well should maintain the smooth ride for you. New love or relationship looks to be on the horizon for Gemini as per the predictions for 2018. The period between February & May 2018 looks just right for the cupid to strike. October & November 2018 appear months that could see passionate and some exciting romance taking place. Looks like you would once again ignite the lost spark in your married life. 2018 horoscope predictions indicate some good signs for Gemini who wish to get married this year. In order for relationships to work they need to be complimented with the right amount of emotion, attitude and endless trust. July & August 2018 are months where you might have to do a little more in order to keep the harmony going with your special one. A bit of caution is advised between 27th June & 28th August 2018 as Gemini forecast for health is not very promising. With chances of injury possible, consulting an astrologer for some astrological remedy wouldn�t be such a bad option after all. Your intelligence and confidence to take decisions on your own make you a wiser and more sensible person. Overall the year 2018 appears to be positive for Gemini. This is the month in which you would be sharing the growth and progress of your spouse. As a couple the two of you should scale new heights. Business travel should prove beneficial. Work partners appear to be the most significant contributors to your profits. You might be required to take some wise decisions to maintain balance of growth and finance at work. Financial commitments and savings would require some thinking to render the best results. With luck standing by your side, February 2018 horoscope denotes an up rise in fortune. Cash flow is expected to remain streamlined with just minor hiccups here and there. Financial front appears to be holding up strongly. An inclination towards religion is predicted. You may go on short pilgrimage to seek spirituality. Peace of mind prevails at home with harmony at the domestic front. Success at professional front should be there as fortune appears to be rolling in your favour. The robust health & confidence enables you to initiate new things smoothly. A slight discomfort at home might make you turn towards religion. Accolades and recognition can be expected for government job doers. Temporary job doers can expect some good news. The society looks to be giving you significant respect. Too much dependency on sheer luck might lead to setbacks. Assets and education should be taken care of while ancestral property might be a reason of dispute among siblings. This is the month that promises some really good financial prospects in your life. The professional front is likely to be smooth journey with hardly any hurdles. You would be receiving praise and acknowledgment for your work. You should achieve economic gains from family business or even government job. Wealth, cash flow and income should remain smooth and even government authorities appear to be turning in your favour. This is the month which might have fewer financial prospects. You may have to do a little more in order to keep the losses at bay. Foreign trip and rewarding government related work should balance the month for you. Charity might be a way by which you share your prosperity with others. You might feel a bit lonely at times but this could be taken as a remedy to stay away from unwanted quarrels and clashes. To make your decisions work, you may just have to push a little harder. Going an extra mile for success isn't such a bad option after all. Financial prospects though not very high but would be moderate and satisfying. Health appears to be slow but not any major loss is predicted. You might have to manage you assets well as this is not a very bright but an overall average month for you. Some minor health issues may slow down your progress. Things should improve soon, making this a fortunate month. Prosperity should rise as your personality and magnetism appear to be improving. You may have the power to purchase things as cash in hand is looking strong. With health taken care of, sources of income would increase as your capacity to earn gets better. This month marks a courageous Gemini. Prosperity and wealth are likely to receive a boost. Your ability to take wise decisions should make you stand out of the crowd. There appears to be a good combination of financial status and livelihood. Chance of pilgrimage is there and overall it appears to be a fine time where you efforts should be appreciated by all. You should be enjoying the success achieved by your siblings. Wise decisions make you a good leader. Growth and dignity at work place & society is there. Spiritual journey looks to be your answer when it comes to avoiding any mental stress. Enthusiasm and learning new things is very much possible this month. You authority and position at work seem to be undisturbed by anything. As a calm and composed individual this month, you name, reputation and fame appear to be on the rise. Government organisations look to best and most viable option for students seeking higher education and even working persons in search of jobs. Financial gains and professional success should go hand in hand this month. The prospect of progeny is not bright but you are likely to be very social this month. A simple and average month is predicted. For job doers November 2018 Horoscope denotes a period of growth in career. Both economic as well as professional growth is indicated. It appears to be a fine moment to enter into new alliances and embarking on new projects. Chances of getting positive news from financial fronts are very much possible. You might just feel the need to focus on health. Stay away from legal and litigation issues as these predict high costs to get resolved. December should offer some really healthy competition for you that sharpens your skills and abilities. On one hand the best is brought out in you, your spouse might show some signs of arrogance. The relation with him/her would soon turn cordial in no time. To perform better at work, you should take good care of your health. Business should have the potential to grow as relations with business partners appear cohesive. You and your spouse would together contribute significantly to overall wealth of the family.